Summer fabrics have arrived. Stop by soon for the best selection of new fabrics, patterns and notions that have been rolling in. Grow With Me children's flannels in fun colors like Creamsicle, Lime, Skyblue, Sunshine Yellow and Pink. Fabric designs include fun little monkeys, birds and geometrics. Perfect for making baby and children's quilts. We're featuring two kits in the shop to make your selection easy. Charm packs available. Ten Little Things by Jenn Ski from Moda. The new fabric line is perfect for that little man in your life. 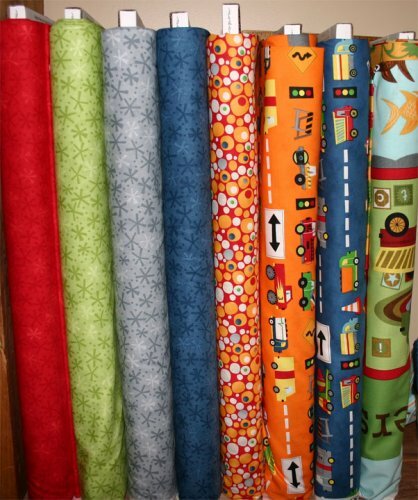 This fabric line in vibrant blue, green, red, gray, line and orange features all of the things that make little boys happy! You'll love using the Ten Little Things panel for a quick and easy child's quilt. Kansas Troubles Sandhill Plums from Moda is a great addition in those deep country colors that you've come to know from this fabric line. Charm packs available. 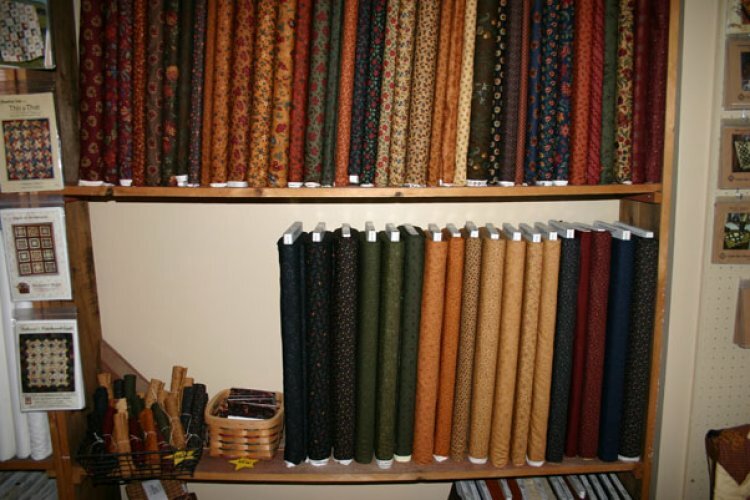 Looking for a great fabric to make a new spring handbag or tote? Ask about the NEW In the Beginning September Light Daisy fabric in red and magenta coordinates or the NEW Moda Made with Love canvas quilting/measuring tape fabrics. California Girl by Fig Tree is a fresh spring fabric that perfect for handbags, aprons, quilts, tablerunners and more! We are featuring the fabrics in tan, coral, fresh green and turquoise. Summerville by Lucie Summers is a new designer of unique fabric from Moda. This fabric, with its cream background and colorful line drawings of houses, flowers, trees and the alphabet will be perfect for summertime projects! It seems to soon to be looking at Fall fabrics, but the Seasonal Gatherings line by Primitive Gatherings is too cute to pass up. You'll love the rich orange pumpkin fabrics as well as the beautiful greens and tans for Fall. Look for new Apple Cider creams and tans from P&B. 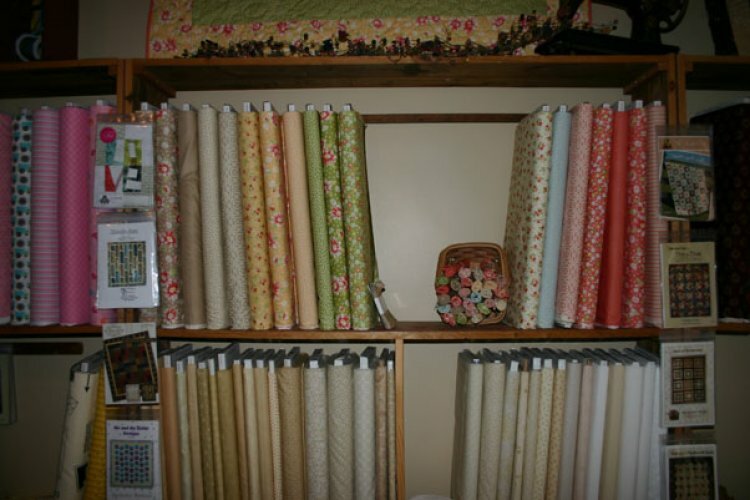 We've expanded our Civil War fabric shelves with new prints from Paula Barnes collections at Marcus Fabrics. New in June - Lucy's Crab Shack from Moda with bicycles and bikinis! New in June - Christmas fabric!! - Blitzen by Basic Grey WATCH FOR MORE CHRISTMAS FABRIC ARRIVING SOON! Look for great deals on Mundial scissors! Clover Mini clips. Ideal for holding binding in place while you stitch. Heat Press Batting Together tape for using up those batting scraps. Buggy Barn "Crazy for Applique"
Country Threads "Back to Charm School"
SamSarah Design Studio - "Hang a Shining Star"
SamSarah Design Studio - "Sew Many Birds"
Crazy Old Ladies - "Geared for Guys"